"Derrick Balagna, will always remember and love you! " 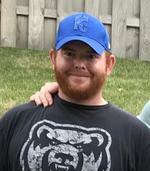 Derrick Ray Balagna, 26, of Platte City, MO, died on Friday, July 6, 2018. Derrick was born April 10, 1992 in Kansas City, MO to Randy and Dixie (Porter) Balagna. He was baptized at the First Baptist Church of Platte City, where he was a member. Derrick graduated from Platte County High School in 2011 before attending Northwest Missouri State University in Maryville, where he was a member of the TKE Fraternity. He loved hunting and gaming, and worked doing maintenance for the Platte County School District for over three years. He was preceded in death by his maternal grandmother; and paternal grandparents. Derrick is survived by his parents; brothers John, Tyler, and Taylor Balagna; and numerous extended family and friends. Following cremation, a visitation will be held Wednesday, July 11 from 10 am to 11 am at the First Baptist Church of Platte City, followed by a memorial service at 11 am. In lieu of flowers, a memorial donation may be made to the American Foundation for Suicide Prevention, www.afsp.org. To send flowers to the family of Derrick Ray Balagna, please visit our Heartfelt Sympathies Store.